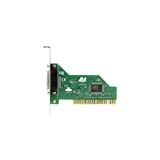 Adds one PCI bus 25-pin Enhanced Parallel Port (EPP) to any PCI-equipped PC. Up to 3x FASTER than standard ISA or motherboard EPP ports - supports transfer rates of up to 4.5 Mbps. 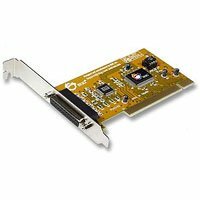 StarTech.com PCI1PECP is a high performance PCI Parallel Port add-in card giving users an additional Parallel IEEE 1284 EPP/ECP port that allows them to connect printers, scanners and portable drives to their PC workstation. The card supports transfer rates of up to 1.5 Mbps for super fast data transfer. 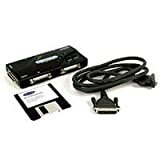 The card includes drivers for Windows XP, ME, 2000, 98, 95, NT4, DOS and Linux and its Plug-and-Play connectivity and step-by-step instruction manual make it easy to install and use. IRQ sharing feature also eliminates IRQ conflicts. On top of this, all StarTech.com I/O cards feature a lifetime warranty that ensures continued operation as long as you need it. Compatible with older parallel peripherals. Up to 3x faster than ISA or built-in parallel ports. The 4-port Bitronics AutoSwitch Kit allows four computers to share one parallel device, like a printer, or lets one PC automatically select between four parallel devices, such as a scanner, Zip&reg; drive, and two printers. Fully automatic when 4 PCs share one parallel device. Works with parallel printers, scanners, Zip&reg; drives, or virtually any IEEE 1284 parallel device. Includes 6-foot IEEE 1284 male-to-male cable. Special file transfer function between four PCs included. Supports automatic printer selection in Windows&reg; 95, 98, 2000, ME, XP, and NT. I have tried everything and I can't get this to work.I have called the number to ask them but everytime I get put on hold and it is costing me for the phone call.Sit on hold finally get frustrated and hang up.If anyone knows how I can get it to work I am sure I would like it.Right now all it does is sit there. It works, I use it, and I am happy with it. 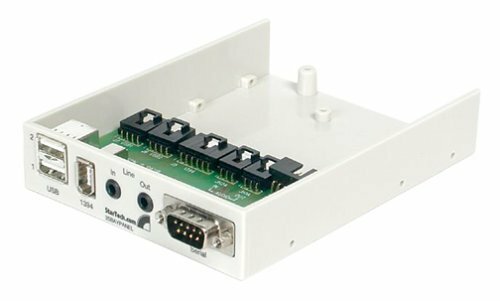 The Belkin Bitronics AutoSwitch Kit - F1U126 is a 4 to 1 switch.It can be configured to operate with 4 PCs sharing one peripheral (4 - 1 mode) or one PC connected to 4 peripherals (1 - 4 mode).Only when it is operatingin 4 to 1 mode will he switch automatically route the PC to the peripheral. When operating in 1 to 4 mode the user must press the SELECT button on theunit to activate the desired port or alternatively run a small applicationon the PC to activate the desired port. This is clear when readingwww.belkin.com but not the case with many online store descriptions of theproduct which, at the time of writing this review, are minimal atbest. The system configuration I am using is one PC communicating to 4peripherals (2 printers, a scanner, and a Zip Drive). The documentationis straight forward but erroneous.I must admit the feel good factor waspretty low when reading the manual.It seems that it is very importantthat DIPSWITCH 1 is set to select '4 - 1 mode' or '1 - 4 mode'. Unfortunately the table and accompanying description do not tie up (or evenmake sense). ON (down) : 1- 4 mode. OFF (up) : 4 - 1 mode. The description for '4 - 1 mode' reads"Set the DIP switch to the OFF position (qu) in order to put theswitch to 4 - 1 mode. "The (qu) is actual exactly what you would seeif you looked at (up) in the mirror.Nearly (qu) but not quite; thestraight vertical on the 'u' is on the wrong side.I couldn't get myprinter to do this if I tried. The description for '1 - 4 mode' reads"Set DIP switch 1 to the ON position (up) in order to put the switchto 1 - 4 mode. "Doesn't exactly tie up with the table. Apart from that small, yet fundamental, problem themanual was OK. The installation couldn't be much easier.Nothing much todo.Well that was the case for the two printers anyway.Just connect allthe cables (the Belkin supplied cable between the switch and the PC, andthe two printer cables from each printer to a port).No power supplyneeded (just as well as none was supplied).with DIPSWITCH 1 in thecorrect position the active port can be selected by pressing the SELECTbutton on the unit until the port's corresponding LED lights up.Prettygood so far (just remember to match the printer selection in the printdialog to the selected port at the switch). Add the scanner andeverything goes down the drain. (I must admit the scanner I bought ischeap and nasty (very nasty actually but that's another story). )Thescanner wouldn't respond.A quick reboot made matters worse - the PC hungduring boot up.Disconnect scanner - PC boots.Reconnect scanner - PChangs.Hm...Quick advance to the Troubleshooting section of thedocumentation. "Lack of Power" in large unfriendly letters. Normally a visit to Radio Shack but I had a compatible supply in the house. with the supply connected the scanner worked provided (and this isimportant) the scanner port was selected on the switch at boot up(something to do with the pseudo SCSI driver the scanner softwareloads). Now for the Zip Drive.No real problem here except that the portthat the Zip Drive is on must be selected at boot up for the pseudo SCSIdrivers to be loaded.Uh oh. Here lies a small flaw in the wholeconcept.If the peripheral's drivers need to see the device at boot upthen only one such device can be used during any one session.For exampleZip and two printers, or scanner and two printers, but never scanner andzip in one session.However, I can live with that.Might be a problem forthe guys trying to access one Zip from 4 PCs though - "excuse me butdon't access the Zip drive because I am booting up my machine." TheWindows 9x Software is extremely minimal and somewhat disappointing.Atiny little app that lets you select one of 4 radio buttons correspondingto the four ports.I must admit I prefer to lean over and press the buttonon the unit, but I suppose if the switch was out of reach this app would beuseful. What I would have been really impressed with was a driver thathooked into (or replaced) the printer selection dialog box (a standarddialog I think) such that selection of a printer automatically selected thecorrect printer.Some one off configuration would be required and thisscheme wouldn't help with Zip or scanner, but i still would have beenimpressed. In conclusion: it works, I use it, and I am happy with it. Sure the operation of the unit is not ideal, but Belkin can't help the wasZip or scanner drivers work.They could improve the documentation thoughand work on the software a bit more. StarTech.coms PCI1P_LP is a high performance PCI Parallel Port add-in card giving users an additional Parallel IEEE 1284 EPP/ECP port that allows them to connect printers, scanners and portable drives to their PC workstation requiring low profile cards. The card supports transfer rates of up to 1.5 Mbps for super fast data transfer. 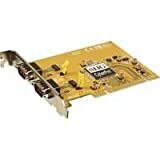 The card includes drivers for Windows XP, ME, 2000, 98, 95, NT4, DOS and Linux. Plug-and-Play connectivity and step-by-step instruction manual make it easy to install and use. IRQ sharing feature also eliminates IRQ conflicts. On top of this, all StarTech.com I/O cards feature a lifetime warranty that ensures continued operation as long as you need it. Careful it is a LOW PROFILE card! Two ECP/EPP parallel ports for easy parallel device connections. 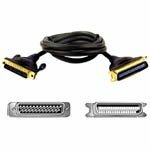 The Gold Series Parallel Printer Cable attaches your IEEE 1284 printer with a Centronics 36-port to your PC with a DB25 port. Featuring 24K gold plated corrosion-proof connectors for maximum conductivity. 24K gold plated corrosion-proof connectors for maximum conductivity. Fastest data transfer for maximum performance (up to 10 times faster than non-compliant IEEE 1284 cables). Tactilite molded strain relief provides a 360-degree turning radius for true protection against damage to the conductors. Tactilite overmold is a supple polymer designed to increase flexibility while maintaining durability. Flextec cable jacket is very durable and extremely flexible for use in tight areas. 24K gold plated copper connectors provide maximum conductivity with no data loss. 18 tightly woven conductor pairs have each data line paired with a ground line to minimize cross talk, noise and other interference, ensuring error-free printing. Connect your printer to a mix of office workstations or home PCs. 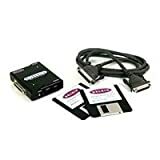 These include an iMac, Power Mac G3, or Windows 98 PC with USB, any PC or UNIX workstation that uses a serial connection, or a legacy Apple workgroup with LocalTalk. The HP Jetdirect Connectivity Card allows USB, Serial and Local Talk connection to any HP printer with an EIO slot. StarTech.coms PCI1S550 adds 1 additional serial port to a PC, allowing users to connect hardware with serial interfaces such as modems, PDAs, digital cameras, serial printers, digitizer tablets, label printers and ISDN terminal adapters to their PC. 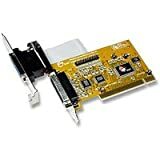 The PCI1S550 is guaranteed to work with any PC (drivers for Windows XP, ME, 2000, 98, 95, 3.1, NT, Linux and DOS are included). It is easy to install and use thanks to its step-by-step instruction manual and its Plug-and-Play connectivity. IRQ sharing feature also eliminates IRQ conflicts. A high-speed 16550 UART 9-pin serial port transfers data at up to 920 Kbps baud rate, ensuring that connected hardware runs at peak performance. Also, built-in 16 byte FIFO buffers work to increase data speeds when multitasking. On top of this, all StarTech.com I/O cards feature a lifetime warranty that ensures continued operation as long as you need it. The SIIG CyberParallel PCI card features one IEEE 1284 ECP/EPP PCI parallel port for easy parallel port connections.The PCI IRQ sharing eliminates IRQ conflicts and the additional port allows improved connections to CD-R/RW, SuperDisk LS-120, digital camera memory card readers, and many other peripherals.The Windows compatible card can be used on any Pentium-class computer with one available PCI slot and running DOS/Windows 3.1x or later, and comes with a comprehensive user manual. With the SIIG CyberParallel PCI cards user-friendly design and versatility, it is a good choice whether building a new computer or upgrading an older one. Dual serial (16550) ports, Universal PCI card design with built-in 32-byte FIFO buffers to work in 32-/64-bit, 3.3V/5V PCI and PCI-X slots. StarTech.coms PCI2S550_LP adds 2 additional serial ports to a PC requiring a low profile card, allowing users to connect hardware with serial interfaces such as modems, PDAs, digital cameras, serial printers, digitizer tablets, label printers and ISDN terminal adapters to their PC. 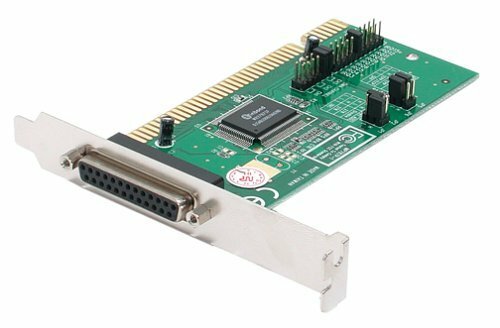 The PCI2S550_LP is a 2-port PCI serial accelerator card guaranteed to work with any PC (drivers for Windows XP, ME, 2000, 98, 95, 3.1, NT, Linux and DOS are included). It is easy to install and use thanks to its step-by-step instruction manual and its Plug-and-Play connectivity. IRQ sharing feature also eliminates IRQ conflicts. Two high-speed 16550 UART 9-pin serial ports transfer data at up to 920 Kbps baud rate, ensuring that connected hardware runs at peak performance. Also, built-in 16 byte FIFO buffers work to increase data speeds when multitasking. On top of this, all StarTech.com I/O cards feature a lifetime warranty that ensures continued operation as long as you need it. 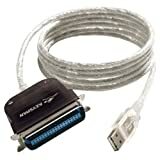 Perfect for connecting serial modems, POS devices, PDAs, digital cameras, printers, ISDN terminal adapters and more, to your system. Installation is a breeze with plug and play support and built in drivers for Windows&reg; XP, ME, 2000, 98, 95, NT4, 3.1 and DOS&reg;. Plus, IRQ sharing and hot swapping capabilities guarantee convenient, hassle-free connections. Backed by StarTech.coms lifetime warranty and FREE LIFETIME tech support.